Seven-card stud is a variant of stud poker. Until the recent increase in popularity of Texas hold ’em, seven-card stud was the most popular poker variant in home games across the United States, and in casinos in the eastern part of the country. Seven-card stud is also played in western American casinos, but Texas hold ’em is far more popular there. Two to eight players can play. The descriptions below assume that you are familiar with the general game play of poker, and with hand values. They also make no assumptions about what poker betting structure is used. In casino play, it is common to use a small ante and bring-in. In home games, it is typical to use an ante only. Play proceeds as follows (“player” refers only to those who have not folded and are still in the game), with betting rounds in-between. Betting is clockwise, the player with the highest poker hand showing starts (ie 2-2 beats K-Q). Mnemonic: Two down, four up, one down. The game begins with each player being dealt two cards face down and one card face up. If played with a bring-in, the player with the lowest-ranking upcard pays the bring-in, and betting proceeds after that in normal clockwise order. The bring-in is considered an open, so the next player in turn may not check. If two players have equally ranked low cards, suit may be used to break the tie and assign the bring-in (see high card by suit). If there is no bring-in, then the first betting round begins with the player showing the highest-ranking upcard, who may check. In this case, suit should not be used to break ties. 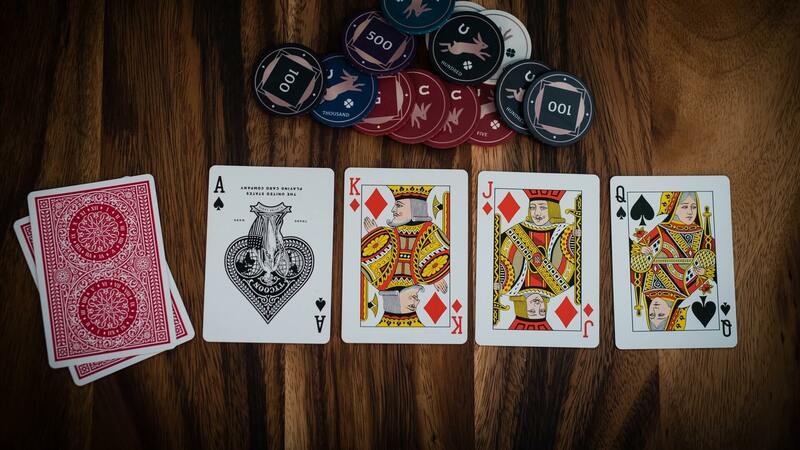 If two players have the same high upcard, the one first in clockwise rotation from the dealer acts first. You may note that seven cards to eight players plus four burn cards makes 60 cards, and there are only 52 in the deck. In most games this is not a problem because several players will have folded in early betting rounds. But there are certainly low-stakes home games where few if any players fold. If this is the case in your game, you may want to limit the game to seven players. If the deck does become exhausted during play, previously-dealt burn cards can be used when only a few cards are needed to complete the deal. If even those are not sufficient, then on the final round instead of dealing a downcard to each player, a single community card is dealt to the center of the table, and is shared by everyone (that is, each player treats it as his seventh card). Under no circumstances can any discarded card from a folded hand be “recycled” for later use. Unlike draw poker, where no cards are ever seen before showdown, stud poker players use the information they get from face-up cards to make strategic decisions, and so a player who sees a certain card folded is entitled to make decisions knowing that the card will never appear in another opponent’s hand.